This weather station is privately owned and operated, is not affiliated with the City of North Bend, WA and the data on this site should not be used to base important decisions that could result in harm to people or property. Located at a private residence in North Bend, WA. The station is powered by a Davis Vantage Pro 2 Weather Station (Model 6312). The station comprises of an anemometer with windspeed and direction, rain gauge, temperature sensor, humidity sensor, barometer, solar radiation sensor, and UV sensor. My Weather data shown online is collected from the weather station using Weather Display Software. The data is collected every 2.5 seconds to a Windows computer and the web site is automatically updated at 10 second intervals with current condition. The stats and graphs pages are updated every 5 minutes. North Bend is a city in King county, Washington, United States. The town was made famous by David Lynch's television series Twin Peaks (also filmed in nearby Snoqualmie.) Since the Weyerhaeuser sawmill closed, North Bend has become an upscale bedroom community for the Eastside of Seattle, Washington, with property values more than doubling from 1997 to 2006. The population was 5,731 at the 2010 census. The Native Americans who inhabited the Snoqualmie Valley, led by Chief Patkanim, sided with settlers in the wars of the 1850s and, with the Treaty of Point Elliott, lost such title as settlers acknowledged. Some of the soldiers in those wars, such as the brothers and sisters Kellogg, established cabins near their blockhouses; however the first permanent settler in the valley was Jeremiah Borst, in 1858. In 1865, Matts Peterson homesteaded the site that ultimately became North Bend. Deeply in debt, he sold the property to Borst and moved east of the mountains. Borst wrote to Will Taylor, who had left the area to go mining in California, and offered him the Peterson place in exchange for labor. Taylor returned and prospered as a farmer and operator of a trading post. He platted North Bend as Snoqualmie but because another nearby town had the same name, renamed it Mountain View. 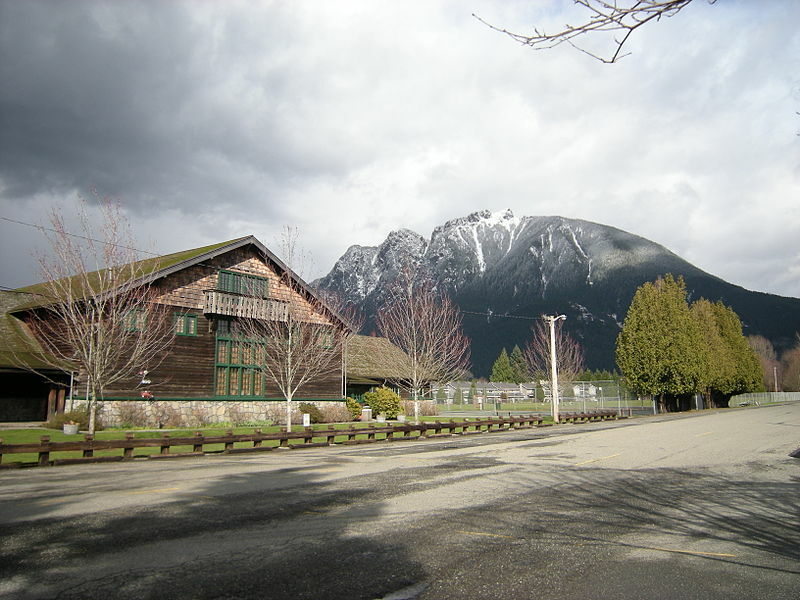 However, the Post Office Department objected to the name Mountain View, so it was renamed North Bend after its location near the north bend of the South Fork of the Snoqualmie River. North Bend was officially incorporated on March 12, 1909.